A new book challenges popular assumptions about the superiority of private-school education and raises questions about the political imperatives behind current school-reform and policy initiatives that are based on market theory. The newsest book by education researchers Christopher and Sarah Lubienski is published by the University of Chicago Press. 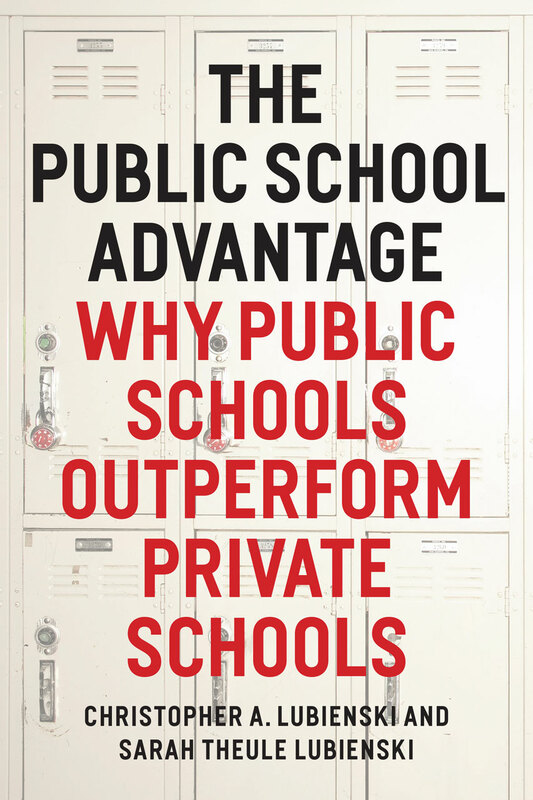 While market theorists promote consumer choice, school autonomy and privatization as the panacea for the problems in America's public schools, many of their policy and reform initiatives are "misguided" and not supported by the evidence, say the authors of The Public School Advantage: Why Public Schools Outperform Private Schools (University of Chicago Press). In the book, education researchers Christopher Lubienski and Sarah Theule Lubienski present exhaustive analyses of data related to student achievement in the public, private and charter school sectors and examine a variety of student, school and teacher characteristics to determine which of them may affect student achievement. Their study is believed to be the largest and most comprehensive to date on the topic. WATCH AN INTERVIEW ON MSNBC 'THE CYCLE': Public vs. private schools: Which are better? Christopher and Sarah Lubienski’s new book, The Public School Advantage, claims that public schools are better at teaching math than private institutions. "These findings are really more relevant to policymaking, especially as we as a society attempt to improve our schools. Long-standing assumptions about the superiority of private schools appear to be misguided according to these data. But those assumptions have been quite prominent in recent years as some policymakers have tried to move students and funding to private schools through voucher programs, subsidies, or tax credits for instance. Furthermore, the rapidly expanding charter school movement that is so popular with policymakers is premised on the assumption that attributes of private schools — autonomy, choice, etc. — can be used to reconfigure and improve public schools. Our analyses suggest that this is not accurate." "The mathematics methods courses taught in the College emphasize the importance of research-based instruction centered around student reasoning, problem solving, and current standards. This approach is bolstered by the findings in our book, given that we found that such methods are an important advantage for public schools. In contrast, we found that U.S. private school students, on average, were more likely to view math as fact memorization when compared with their public school counterparts. The fact that private schools have the autonomy to continue using outdated instructional methods appears to be detrimental to their students' achievement on today's tests." Read the full article by the Illinois News Bureau.